Maybe he just got it wrong. After all, the opposition made lewd accusations about him. They hated him, hurled vicious insults at him and called him delusional. He was from the confederate state of Kentucky, married to a confederate wife, whose family actually fought for Jefferson Davis, yet the opposition still protested his election. They started a great civil war over his presidency, because President Abraham Lincoln abhorred the very-common practice of enslavement, something that is still prevalent around the globe, today. So maybe our 16th President of the United States of America just got it wrong when proclaiming “the fourth Thursday of every November” be officially recognized, “with dutiful prayer, as a day of Thanksgiving, under God.” President Lincoln made the proclamation, establishing Thanksgiving as a national holiday, just months after the Battle of Gettysburg: a devastating victory, wrought with unparalleled military bloodshed, changing the outcome of the war and thus the future of our country, to favor “the right to life, liberty and property” for all humanity. Perhaps most importantly to note is that the rights recognized by the 14th Amendment after the Civil War, and signed into law by President Lincoln, were not just for some; whether based on size, age, gender, color or creed. President Lincoln made every person sovereign, equal in rights to any other sovereign entity; including any state or even a country. These are called our individual rights, which so much bloodshed obtained. Three minutes and 270 words later, Lincoln sat down, convinced that he missed his mark. Franklin Roosevelt seemed to think President Lincoln was wrong, and might have even referred to President Lincoln as a “bitter-clinger.” Like other Lincoln-policies, FDR amended the actual date of Thanksgiving, changing it from its original date, on “the fourth Thursday,” to “the third Thursday of each November.” Socially-engineering more shopping by the people, it was FDR’s attempt of boosting his failed economic policy, which crashed the market of the roaring twenties, instead using government authority to exert power over the people’s free-will while manipulating the free-market. It was meant to benefit corporate America’s profit margin, and the federal government’s tax-revenue-margin, alone. The only party left with less “revenue margin” would be the American people, themselves. Roosevelt was finally overturned by a determined Congress, one understanding that traditional American values matter. So Congress itself re-established the original date set forth by America’s founding father: President George Washington. The day of Thanksgiving was to be celebrated on the 26th day, then the fourth Thursday of November, once again. General Washington believed our independence attained was the will of God, achieved by outgunned and outnumbered colonial farmers fighting against the largest military on the planet. A united America (north, south, east, west) was the first to ever achieve independence from the tyranny of the British Empire, and in doing so, recognizing that natural rights are endowed by God. Our rights are not granted by a government (local, state, or federal) who could just as easily take them away, as present them. To those merely “pranking” his legacy, and others too cowardly to stand firm (in places like liberalized, Virginia), President George Washington must have been wrong too. Maybe to radical atheists, freedom for all is wrong. Thank God none of us have to agree with them. It is also noteworthy, that when united, America remains an undefeated country, with freedom as its priority. This fact must serve to enrage the same protesting both our founding, and our endowed rights under God, to no end. My wife, children and I began our own Thanksgiving tradition in 2016. Now, President Lincoln’s proclamation of Thanksgiving is read before any and all Thanksgiving festivities begin. You see, instead of tearing down the traditions of any other families, we instead built our own tradition, satisfying our own family. Consistent with history, and to no surprise at all, certain protesters have yet to return to our table to give thanks to God, and acknowledge our shared history. It’s our Read family way of saying thanks be to God, to acknowledge one another, and to always remember what our ancestors endured, achieving our freedom and independence from government empires. Read the following text, underneath the historic caption, for President Lincoln’s proclamation, marking the first federally recognized day of Thanksgiving. 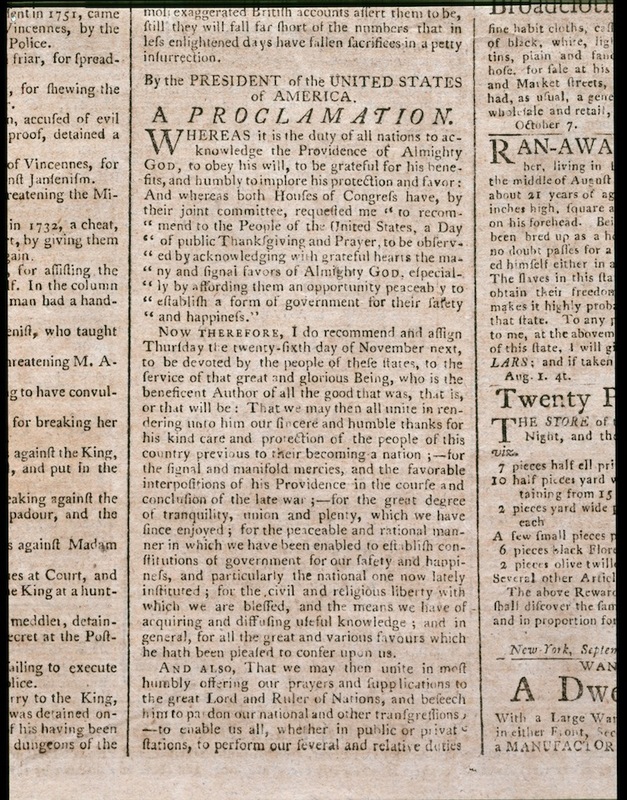 Contained underneath the proclamation is a video-embed of the speech given by our 16th President of the United States of America, made while presenting the proclamation of Thanksgiving on October 3rd, 1863: seventy four years after President Washington first acknowledged Thanksgiving under God & done so at the behest of a seventy four year old magazine editor.